Eastern Wyoming College is pleased to announce Chief Justice, Wyoming Supreme Court, Marilyn S. Kite will be the speaker at the 62nd annual commencement ceremony. The ceremony will be held on Friday, May 6, 2011 at 7:00 pm in the EWC Fine Arts Auditorium. The Honorable Marilyn S. Kite was appointed to the Supreme Court on June 2, 2000. She is Wyoming’s first female justice. She became the Chief Justice on July 1, 2010. Prior to her appointment to the Wyoming Supreme Court, she served as Senior Assistant Attorney General for the State of Wyoming from 1974 through 1978. She then entered private practice with Holland & Hart, a regional law firm where she remained until her appointment to the Supreme Court. During her private practice, she served on the faculty of the Western Trial Advocacy – University of Wyoming and the Denver Regional National Institute of Trial Advocacy. She also served as a member of the Board of Trustees of the Rocky Mountain Mineral Law Foundation and the Tenth Circuit Court of Appeals Advisory Board. She received her B.A. from the University of Wyoming in 1970 with honors and her J.D. from the University of Wyoming Law School in 1974. Commencement activities will begin with a steak fry for graduates and their families in the Student Center at 4:30 p.m. on Friday, May 6th. The commencement ceremony will begin at 7:00 p.m. with a processional provided by Janet Howard, Pianist. Ms. Connie Woehl, Associate Director for Outreach and Learning, will serve as the Director of Ceremonies. The National Anthem will be sung by EWC student, JoAnn Robbins. Dr. Tom Armstrong, president, will then provide a welcome and introduce special guests. Mr. Dillon Mortensen, Student Senate President will provide a welcome on behalf of the students. Kite will then address the graduates. Dr. Dee Ludwig, Vice President for Learning, will present the candidates for graduation. Following will be the presentation of Diplomas by Carl Rupp, President of the College Board of Trustees. Eastern Wyoming College Foundation President, Patrick Korell will then present the 2011 Distinguished Alumni Award and the 2011 Distinguished Service Award. The closing remarks will be spoken by Woehl. There will be a ceremony to honor the GED graduates on Thursday, May 5, 2011 at 6:00 pm in Tebbet room 131. For more information about the commencement ceremony, please call the College at 307.532.8200. The Workforce Development Office at Eastern Wyoming College presents Nutrition Support Assistant class. The cost for this one day class is $50 and will be held on Tuesday, April 26, 9 am –6 pm at the Crook County Medical Services CNA training room in Sundance. The Nutrition Support Assistant will be trained to meet the following requirements: • Enhance the nutrition and hydration services provided to nursing home residents. • Reduce the incidence of unplanned weight loss and dehydration. Students will be under the supervision of a licensed nurse and shall not assist residents who have complicated feeding problems. They will meet requirements of a minimum of eight hours training and competency. This course includes a written exam and competency skills test which requires a grade of 80% or higher. The students will have to attain six hours of continuing education per year. To register for this class or for more information, contact Melissa Buckmiller at 307.283.1030, or email at buckmillerm@crook1.com . 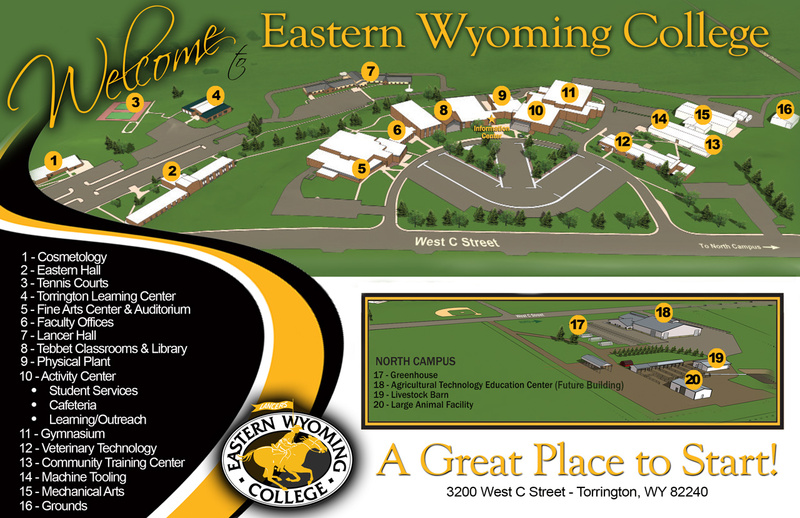 It is time to register for fall classes at Eastern Wyoming College. Summer registration dates are Monday, June 13th at 9:30 a.m., Monday June 27th, at 9:30 a.m. and Monday July 11th, at 9:30 a.m.
Each day will begin with a discussion about your educational goals and how EWC can help students achieve those goals. EWC instructors will discuss classroom expectations and other information that is important to success. COMPASS placement testing will take place for those who need it after the discussions. The placement test is used to ensure placement into the appropriate English, Reading, and Math courses. There is a $15 fee for these computer-based tests. Please bring a calculator for the mathematics portion of the test. Parents are invited to attend a program entitled “You and Your Student” while their student is testing. Advisors will be available to assist in registering for fall classes following the testing. Financial Aid personnel will be available to assist with the financial aid process and preparing the FAFSA. Please register for fall classes as soon as possible to get the classes you need. Call 1.866.327.8996 ext. 8230 or 307.532.8230 for more information or to sign-up for one of these pre-registration sessions. The Eastern Wyoming College Society for Creative Anachronism club presents The Widow’s Bane Band. This performance will take place on April 16, 2011 at 7:00 p.m. in the EWC Fine Arts Auditorium in Torrington, Wyoming. Tickets are on sale now and are $7 for adults and $5 for students. Tickets may be purchased at the door, from any SCA member or at the EWC Library. The Widow’s Bane Band from Boulder, Colorado are a gypsy pirate rock band and have made a name for themselves as one of the finest roots music bands around. They describe their unique mix of sea chanties and work songs as “zombie death polka” (there is an accordion). For more information please call Becky Lorenz at 307.532.8210. The Eastern Wyoming Arts Council presents The Betty’s. This performance will take place on April 15, 2011 at 7:00 p.m. in the EWC Fine Arts Auditorium in Torrington, Wyoming. The Betty’s are an all female a capella group with a very diverse collection of ladies from the University of Wyoming. These ladies have a broad spectrum of majors, but share a passion for music. The group performs in a variety of locations for alumni, high schools, the University of Wyoming, and for the public in general. Their repertoire is composed from multiple genres, ranging from 30’s barber shop to some chart-toppers of today. Tickets are $10/adults, $7/Seniors, $5/K-12 and may be purchased at the EWC Community Education office, or by calling 307.532.8213 or 307.532.8323.